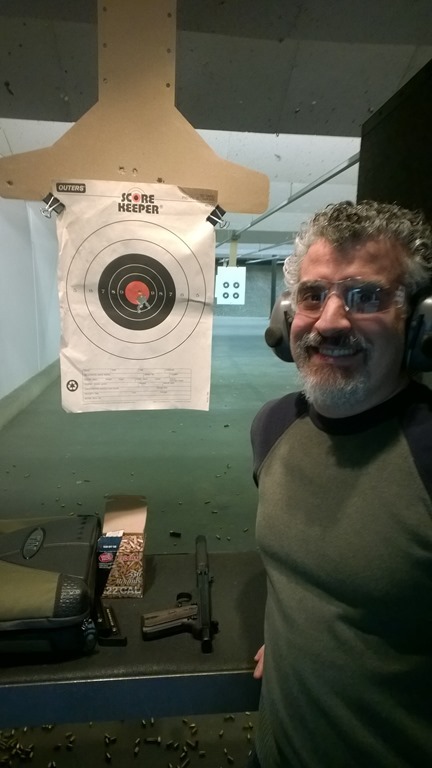 I took a former boss of mine, Marcello, to the range today. It was over two months ago that he had express an interest in going shooting for the first time but schedules hadn’t worked out until today. Before we stepped onto the range we did the normal safety, grip, stance, and sight alignment stuff. I thing asked what he wanted to get out of this range session. His was a different story than I had ever heard before. He was a little bit scared of guns. He wanted to resolve that. He wanted to be either comfortable with guns or know for certain that it wasn’t for him. I’m sure nearly all of my readers know how this is going to resolve. That is the result of firing his first 20 rounds of .22 LR from my Ruger Mark III into a target nine feet away. I verified on another target at 21 feet the sights are a little off. The gun is shooting a little bit to the right. I would edit the picture to emphasize his smile but it is big enough to easily see in the picture above. 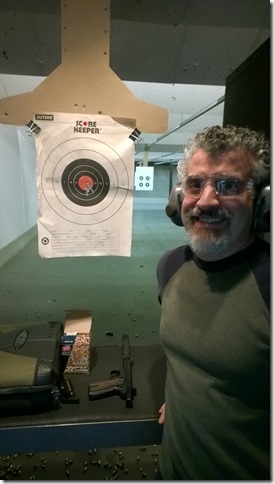 I put up a more difficult target (four diamonds) and moved it out to 15 feet where he continued to do extremely well. I had him put one shot on each diamond. I had him go from low ready to fire on one diamond. I had him go from low ready to fire one round on each diamond until the gun was empty. I had him go from low ready to fire two rounds on each diamond until the gun was empty. He kept probably 80% of the shots inside the diamonds and his speed rapidly increased. I had him shoot a .22 LR revolver in single action mode from 15 feet. First dry fire, then live fire. He did great. Then I had him shoot double action dry fire about a dozen times. It looked pretty good even though you could tell he was struggling a little to get a consistent pause between the cylinder rotation and the hammer falling. The first cylinder of live fire was not very pretty. Everything was on paper but not many were on the diamonds. The second cylinder was much better. Nearly all were in the diamonds. He moved on to 9 mm. Dry fire followed by a single round in the gun. 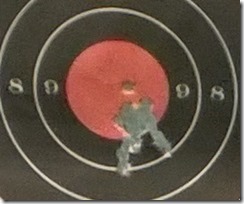 He was a little bit surprised at the recoil even though I told him it would be a lot more. Then I had him shoot two rounds. All the shots were great and I had him empty a magazine into the target. Again all good and his speed was picking up as well. I had him shoot a few rounds of .40 S&W through my STI. He could tell there was more recoil and it was a bit more than he wanted. He went back to the 9mm and soon his shots were getting a bit wild. Still on paper but not the tight groups on the diamonds like before. It had been nearly two hours on the range and I was pretty sure he was getting tired and maybe developing a bit of a flinch. I suggested he might be getting tired because of the shots weren’t as good as he was doing earlier. He agreed and we packed up and left. I told him about professional training available from Insights offered at the same range, different range options in the area, rental guns, and competition. He seemed interested and told him I would be glad to give him more lessons. He just needs to let me know when and next time he needs to buy the ammo. Winning. One new shooter at a time. This entry was posted in Gun Fun, New Shooters by Joe. Bookmark the permalink. Looking at those groups, I’d say he’s found a new hobby! That “New Shooter Smile” is almost boring in its repetition and predictability. Almost. What’s your 22 DA revolver, and how do you like it? I’ve been eyeballing the Ruger single actions, but a DA would be nice too. Consistent timing from rotation to hammer fall — that sounds like what I’m still struggling with. (I’d rate myself a novice, and not a natural like Marcello.) I do the “squeeze, not yank” thing, but often it seems too slow, not a steady medium speed progression to the hammer dropping. Any suggestions? More dry firing practice? I would suggest mounting a laser on your revolver for dryfire diagnostics. Watching how/when the dot moves as you work the trigger will show you where you need to pay more attention to the action. At some point you MAY decide that the internal action requires some smoothing of working surfaces, but first figure out how consistent you are with the current setup. Also note if your pointing is consistent at hammer drop with different speeds. You may find that you have to stay within a particular window of trigger speed to get a good result. This may open up somewhat after some internal action work. Thanks, I love these stories. Of all the people I’ve taken shooting for their first time (maybe 2 dozen or so), only one didn’t get that grin. She was a rather shy teenager, and I thought it might help her ‘break out of her shell’, but she just didn’t seem interested. She wasn’t opposed to guns, nor scared of them, just disinterested. It was a disappointment, but not enough to ruin a day at the range. I agree, generally. It’s rather snappy, more like a hit than a push when compared to heavier and slower rounds. But, as always, monitor the shooter and adjust as needed, because each one is different. I concur, with the minor corrective that even factory FMJ ammo from a 1911 in .45 will feel easier than .40 — it doesn’t need to be light target loads. There’s a sharp break between training one shooter, and 3 or more shooters. You have to give them a break, when they’re shooting, say, more than 10 rounds per ten minutes? They’re not happy with that, because they’re usually eager to shoot. but it’s surprising how few rounds it takes to tire a shooter .. especially a New hooter. They’re trying really hard to do well. And then they DO do well, and the adrenaline pumps up, and they think they can shoot forever. And they want to. Then have them try that for no more than ten shots. And then show them different shooting stances, describe the advantages and disadvantages in each, and let them try the different stances in the next 15 minutes. And then find something else besides shooting to hold their attention for another 10 minutes. They won’t realize they’re getting tired (“how could I be tired, I’m having fun!) until their performance flags. And then they are disappointed. The best way to keep a new shooter’s performance level up, and keep the interest level up (don’t let them get disappointed) is just like a comedy routine. Always leave them laughing, and always leaving them wanting more.